I have loved apricots for as long as I can remember. They color my fondest memories of growing up in Saratoga, a village tucked into the forested fringe of the Santa Clara Valley. In the 1960s, orchards still extended in every direction, and as a child, I assumed they always would. Today this area is known as Silicon Valley, the world’s greatest engine of innovative technologies. But not long ago it was a magical landscape known as the Valley of Heart’s Delight. The Valley of Heart’s Delight flourished for 100 years, from the California Gold Rush until World War II, with family farms spreading across 125 square miles. Then, as now, the area enjoys coastal cooling through its northern border with the San Francisco Bay and inland warmth from the protective Coast Range Mountains that frame it to the east and west. 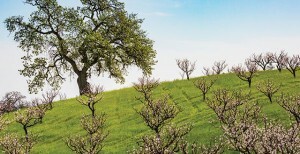 Blessed with some of the richest topsoil in the world and a nearly year-round growing season, the Valley of Heart’s Delight was unique for its agricultural productivity and fruit orchard production. As Eugene Sawyer, a visitor to the valley in 1875 observed, “The fruit industry grew by leaps and bounds; vineyards, pastures and grain lands were converted into fruit orchards until the county became one vast orchard—the largest in the world.” Close your eyes and imagine this valley, now clogged with traffic and urban sprawl, filled end to end with delicate spring blossoms. Not so long after the war, in 1960, my family arrived in San Francisco, following my father Edward’s medical career. After a few years, we moved to Saratoga. Our property included a remnant French prune orchard with an arboretum of apricot, peach, apple, persimmon, lemon, orange, fig, kumquat, loquat, almond and walnut trees. I later learned that this orchard was part of the 700-acre Glen Una Ranch, the world’s largest French prune orchard and the site of Saratoga’s first Blossom Festival in 1900. The orchard and gardens embraced our Spanish-style ranch house. Large picture windows framed views to the west toward the Santa Cruz Mountains and to the east across Santa Clara Valley to distant foothills. This wonderful place gave me plenty of scope for exploring and experiencing the natural world. Embraced by the mountains above, orchards around me, and valley below, I developed a deep sense of connection to the seasonal rhythms of the orchard and to the entire region. My mother, Aileen, was a gifted cook and gardener, and I learned to anticipate wonderful meals in her kitchen. Everything she made was home-cooked using seasonal vegetables and fruit picked right outside our kitchen door. Her passion for fresh ingredients and inventive cooking taught me lessons that have influenced my entire life. Despite the Garden of Eden in my own backyard, the Valley of Heart’s Delight was quickly disappearing as I grew up. The region’s transformation from farms and fruit orchards to silicon manufacturing plants and suburbs occurred swiftly, within one generation. The dramatic loss of the orchard landscapes touched me deeply and influenced both my education and choice of a career in city planning. As Joni Mitchell sang on our stereo, “You don’t know what you’ve got till it’s gone; they paved paradise and put up a parking lot.” It was not until years later, when I revisited Saratoga on a regular basis to care for my aging parents, that I realized only one commercial orchard remained in the area: Novakovich Orchards on Fruitvale Avenue. Visiting this orchard with my elderly father became a comforting habit and happy reminder of my childhood home that had been sold long ago. We enjoyed chatting with the Novakovich family while purchasing Blenheim apricots, cherries and other farm products, and letting time slip away during walks through their orchard. These visits rekindled my love of apricots and appreciation for the Santa Clara Valley’s quickly disappearing agricultural heritage. For the Love of Apricots grew out of this reconnection with my orchard roots. The inspiration to bring my love of apricots, baking and orchard heritage together in a cookbook struck me during a winter orchard walk. I began cultivating relationships with many of the remaining orchardists in the region, some of whom shared favorite recipes of their own. I planted several apricot trees in my own yard and was delighted when they bore fruit. I tested countless recipes and participated in many apricot festivals and fairs. I started a blog, fortheloveofapricots.com, to share my orchard experiences, recipes and memories. My blog helped connect me with others who had similarly fond memories of the Santa Clara Valley and apricots. It turns out that many Californians, particularly those born before the 1970s, share a deep, nostalgic love for this fruit. I have tried to capture that sentiment, along with the history of the Santa Clara Valley, in essays scattered throughout this book. There are good reasons apricots are called the “Prince of the Orchards,” and words alone cannot describe their delicate beauty. This makes me all the more grateful for the beautiful orchard photography by Eric Larson, delectable food photography by Jessica Yager (the book features 129 full-color photographs) and creative graphic design by Martha Runco. I’m also thankful for the expert technical and research support from Neal Casteel. For the Love of Apricots is also meant to be a tribute to the orchardists and farmers who keep a small but vibrant flame alive in the Valley of Heart’s Delight. I hope that they will find a way to continue for another generation and beyond! The above was excerpted from the introduction to Lisa Prince Newman’s book, ‘For the Love of Apricots: Recipes and Memories of the Santa Clara Valley.’ The book will be available in June—both online and at local apricot growers, including Novakovich Orchards, Andy’s Orchard and C.J. Olson Cherries.